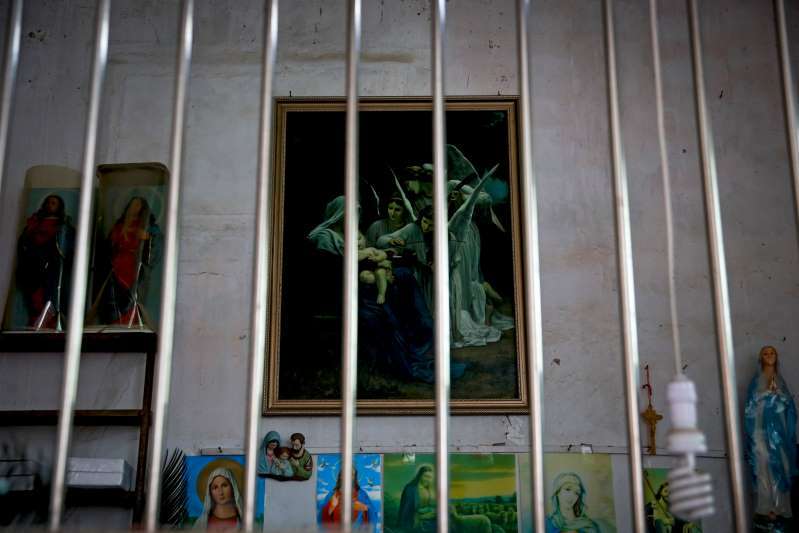 © Andy Wong, AP In this Tuesday, March 27, 2018, photo, Catholic religious paintings and figures are displayed behind bars at an underground Catholic church in Jiexi county in south China's Guangdong province. A group that monitors Christianity in China says the government is ratcheting up a crackdown on congregations in Beijing and several Chinese provinces, destroying crosses, burning Bibles and ordering followers to sign papers renouncing their faith. After decades of negotiations, the Vatican signed a provisional agreement with China Saturday under which Pope Francis will recognize seven bishops appointed by Beijing who were previously not accepted by church authorities. The seven, from the state-supervised Catholic Patriotic Association, had been excommunicated by previous popes because they were not selected by the Vatican. The controversial agreement, announced by the Vatican, also allows for the establishment of a diocese north of Beijing for the first time in more than 70 years. China has some 12 million Catholics divided between an underground Church loyal to the Vatican and the Catholic Patriotic Association. Beijing and the Holy See severed relations in 1951, two years after Communist party won China's civil war, in large part over Beijing’s insistence that it must approve bishop appointments in China. “Pope Francis hopes that, with these decisions, a new process may begin that will allow the wounds of the past to be overcome, leading to the full communion of all Chinese Catholics,” the Vatican said in statement. L'Osservatore romano, the Vatican newspaper, called the agreement "a truly important step in the history of Christian in China." The Vatican did not address the fate of the bishops associated with the underground church in its brief statement. Neither the Vatican nor Beijing released the full text of the agreement. Some Chinese Catholics have opposed such a deal. Cardinal Joseph Zen of Hong Kong has warned against selling out the Chinese Catholics who refused to join the state church and endured years of persecution for remaining faithful to Rome. Zen didn’t reply Saturday to an Associated Press request for comment. But on his blog, he criticized the lack of specifics in the accord, including no mention of the status of several underground bishops named by the pope. A Vatican spokesman indicated the accord would serve as a blueprint for future appointments of bishops, who lead the faithful in their dioceses. Cardinal Pietro Parolin, the Vatican secretary of state, indicated – but did not specifically confirm – that the pope and Chinese authorities would jointly approve the appointment of new bishops. "What is required now is unity, trust and a new impetus," Parolin, the No. 2 Vatican official, said in a video message recorded before he left Rome to join the pope in Vilnius, the Catholic News Service reported. "To the Catholic community in China – the bishops, priests, religious and faithful – the pope entrusts, above all, the commitment to make concrete fraternal gestures of reconciliation among themselves, and so to overcome past misunderstandings, past tensions, even the recent ones." It wasn’t immediately clear how the new accord would affect Catholic leaders who had opposed Chinese authorities. Bishop Guo Xijin of Shanghai, head of an underground diocese, was picked up by government agents in March. The Rev. Bernardo Cervellera, chief editor of the missionary news agency Asia News, told the AP that Guo and others had been placed under house arrest, and some priests were imprisoned. He said some 10 priests were in prison in Hebei province near Beijing about a year ago, but he didn’t know their current situation. Francesco Sisci, an Italian sinologist and researcher at Renmin University in Beijing, told the South China Morning Post that the Holy See had consulted all bishops in China before signing the deal. “Many people outside China will say Beijing has not delivered on its promises, and that the Vatican has been cheated, but all bishops in China are in favor of the deal,” Sisci said.